Termites all belong to the phylum Arthropoda, the class Insecta, and the order Isoptera. There are over 2,000 different species of termites with over 40 species in the United States alone. Although they have distinct characteristics, most look similar. They typically measure between 1/4 and 1/2 of an inch long and have soft bodies with straight antennae. The queens and kings are larger, capable of reaching over one inch long. Colors range from white to light brown where worker termites often appear lighter, while swarming termites darker. Flying termites, also called reproductives, have two pairs of prominent wings. Learn more about what a termite looks like. Cryptotermes spp. and Incisitermes spp. Reticulitermes spp., Coptotermes spp. and Heterotermes spp. Based on the layout of your home and the degree of termite infestation, Orkin will create a customized treatment plan tailored for your home. This can include a variety of treatments such as Termidor Liquid, Dry Foam and OrkinFoam, and Sentricon Bait and Monitoring dependent on the areas of usage, situations, and species of termite. Learn more about our termite treatments here. HOW DID I GET TERMITES? A termite infestation and damage can be devastating to your home or property. Termites are often called the “silent destroyer” because they may be secretly hiding and thriving in your home or yard without any immediate signs of damage. All termites consume cellulose-based plant materials. Unfortunately, all homes, regardless of their construction type, can provide cellulose food for termite infestation. Mud tubes on exterior walls, wooden beams or in crawl spaces. Three of the more common home-invading termite species are Eastern subterranean termites, Pacific dampwood termites, and Southeastern drywood termites. Trees and shrubs planted close to the building. Above ground locations in the house that remain damp enough to support termites without them needing to return to the moist conditions found in the soil. Since termites are a constant threat to your home, here are some things you can do during the year to help maintain the effectiveness of Orkin’s termite treatment plan. Small steps make a big difference in termite prevention and sustaining an effective termite treatment plan. Start by eliminating moisture conditions and termite food around your home. These simple steps make your home a less attractive target, helping deter termites. Read more termite prevention tips. Learn more about how Orkin controls termites. Commonly, termites live in wooden structures, decayed trees, fallen timber, and soil. Habitats vary among species as some termites require different amounts of moisture. The pests are found in greater numbers in tropical regions where living conditions for termites is optimal. Subterranean termites are the most abundant variety and can be found throughout the United States. Both dampwood and drywood species are generally more localized in the Southern states. 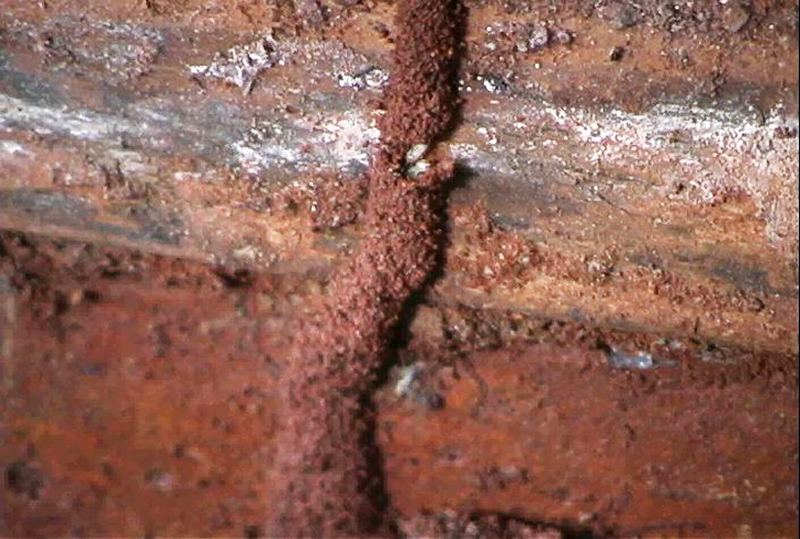 Subterranean termite homes are usually formed in soil. Within these mounds, termites build elaborate tunnel systems and mud tunnels through which they access above-ground food sources. Drywood termites live within the wood they consume and oftentimes infest walls and furniture. Termites are detritivores, or detritus feeders. They feed on dead plants and trees. Termites get nutrients from cellulose, an organic fiber found in wood and plant matter. Wood makes up the majority of the pests’ diet, although termites also eat other materials such as paper, plastic, and drywall. Most species prefer dead wood, but some termites feed on living trees. Each type of termite has its own dietary preferences. Subterranean termites prefer softwoods, but may invade most species of wood. Dampwood termites generally stay close to the ground, but will choose moist, decaying wood anywhere it is found. Drywood termites are often found in attics and require little moisture in the wood they eat. A termite’s mouth is capable of tearing pieces of woody material. This ability is what causes concern in human dwellings: while termite workers only measure approximately 1 cm to a few millimeters in length, their feeding habits are capable of causing costly damage to property. House foundations, furniture, shelves and even books are all possible feeding sites for termites. Read more about what termites eat. Workers and soldiers live approximately one to two years. Queen termites may survive for over a decae under optimal climate conditions. Workers are responsible for gathering and feeding the colony members, maintaining the nest, and caring for young. Soldiers protect the termite colony using their large mandibles to fend off predators. Reproductives are the only sexually mature members of the colony, aside from queens and kings. Read more about termite colonies. The life cycle of the termite begins with a mating flight, wherein swarming winged reproductive males and females leave established colonies and procreate. After fertilization, winged termites land and shed their wings, going on to form new colonies. These insects then become the king or queen termites of their newly established colonies. The queen and king termites are at the center of the termite life cycle and are responsible for reproduction. After the fertilized queen lays her eggs, they hatch into pale white larvae. Eggs hatch into larvae and molt (shed their exoskeletons) to develop into workers, soldiers, primary reproductives and secondary reproductives. A nymph is a young termite that is going through molts to become a reproductive. The termite growth process begins with a process called molting. First, a termite develops a soft exoskeleton under its current, hard exoskeleton. Then, once the termite has reached maturity, its outermost skeleton splits open, and the new exoskeleton enlarges and hardens. This molting process continues throughout a termite’s life cycle based on the colony’s needs. Over the course of several molts, these larvae grow to assume a role in one of the three termite colony castes: workers, soldiers and reproductive termites, also known as alates. Termites cost Americans more than $5 billion in damage each year and most insurance plans don’t cover the damage. In the summer months, reproductive flying termites leave their mature colonies to mate and pair off. Immature termites develop to fill one of three roles: workers, soldiers, or reproductives. Some species of termite queens lay millions of eggs each year. Workers are responsible for gathering and feeding the colony members, maintaining the nest, and caring for young. Soldiers protect the termite colony using their large mandibles to fend off predators. Reproductives are the only sexually mature members of the colony, aside from queensand kings. Do Termites Fly in the House? Can Rain Stimulate Termite Activity in the House? Can Termites Live in Trees? Can Termites Swarm After Treatment? How Do Termites Find Wood? Is a Termite an Insect? What Wood Will Termites Not Eat? How Long Does a Termite Live? Termite colonies are active day and night, feasting on anything made of wood,plants or cotton. Termites attack structures of all types causing homeowners and business owners $5 billion in treatment and damage repair annually.